Now that we have slashed the budget, it's time to look for ways to bring in extra money to supplement what is lost during the furlough. There are so many ways to bring in extra cash, it just requires a little creativity and willingness! Some of these suggestions are obvious, but others may spark an idea. I hope this serves as a valuable resource for you. As I mentioned in my previous post, begin with prayer. Ask God to open up opportunities to earn extra money and be ready for Him to answer. Ask Him to provide during this time, and trust that He will. Never underestimate the power of prayer! I know I mentioned this before as well, but come together as a family and brainstorm ways everyone can help out. Perhaps the kids can pull weeds for the neighbors, or sell ice cream or lemonade to the community. Older kids can bake and sell their creations. Again, including the whole family gets everyone on board and makes it a team effort. If you're looking for work, let people know. Tell your church family, your community, your family that you're looking to earn extra money to make ends meet. You'll be amazed by what comes up simply by spreading the word. Our neighborhood has a wonderful email loop, so I let our neighbors know that we were looking for work. God provided, and continues to provide for us right here in our neighborhood. My husband and oldest son have been providing lawn care services and staining fences. My daughter and I have been baking and selling bread. The convenience of staying in the neighborhood has been a blessing! My husband is a well respected Fire Inspector. He has a great job. He could easily have an arrogant attitude about what jobs he will and will not do. But thankfully, my husband is more concerned about providing for his family than he is about pride. All these small jobs have added up to making ends meet. If we had just sat around waiting for "something better" to come around, we would have missed out on the blessings that have come from the work God has provided, not to mention the income. If there is a salesperson in you, try your hand at these jobs. These are feasible jobs for stay-at-home-moms who want to host fun parties while bringing in additional income. If you've got credit card bills, loans, or medial bills, ask to temporarily reduce your payments just until furlough (or your situation) is over. If you have the money, then make the full payment. But reducing outgoing money gives you some leeway, and allows for extra income when it's really needed. I'm so amazed at what bloggers can make these days. If you have a love for writing, or have a special skill or talent, blogging may be a fun way to bring in extra cash. When we were planning my daughter's wedding, I blogged full force to bring in extra wedding money. Since then, I've cut way back due to time and other priorities, but I still manage to bring in a little extra money from the blogging I'm able to do. Escalate Network-Product or company advertising....earn money per conversions. Amazon Affiliate-Earn commission on products people buy through your Amazon links or widgets. Depending on your current rate, this could add income by lowering your mortgage payment. We were able to refinance when the rates dropped, helping to reduce our payments by a couple hundred bucks. Anything. School curriculum, book, clothes, furniture, toys, baby items, extra vehicles, etc. Look around and find what you don't need or want. Sell items on Craigslist, Ebay, yard sales, FB yard sale community pages, homeschool co-ops, classifieds, anywhere! We love to take our gently used clothing to resale shops for store credit or cash. Try places like Kid to Kid, Uptown Cheapskate, Clothes Mentor, or Plato's Closet. Check your local area to find out if these, or places similar, exist in your area. I recently learned that you can sell scrap metal. Seriously! You can take your old appliances and a whole host of other metal items and sell them to recycling centers. Check your local listings for recycling centers near you. If you enjoy baking bread or other goodies, ask to sell them at church, work, or a co-op group. When we were raising money for my daughter's mission trip to Africa, our church and homeschool co-op group allowed us to sell bread. We made a few hundred dollars. Currently, my daughter and I are selling bread to our neighborhood. We may offer freezer meals soon. Maybe. One of my friends, who is also in the midst of furlough, is selling breakfast tacos and freezer meals to her husband's co-workers. They have brought in quit a bit of money, thus surviving the furlough. Get creative and don't be shy! Whether you sew, bake incredible bread, or you're a talented artist, offer classes in your home. Choose a day of the week and come up with a price (which includes supplies) and spread the word via the Web or flyers. If you have a special skill, there are others out there willing to pay to learn it! Amazingly, this has been our biggest source of additional income during the furlough. I simply advertised to our neighborhood, and another close by, that my husband was available for lawn care services. We received multiple calls, three with ongoing weekly service. My husband and son have enjoyed working together, building their relationship while helping to provide for our family. This is always a good source of additional income. If you want to provide childcare long term, you may need to check into licensing laws in your state. But if you want to offer temporary services, give a shout out to your friends and neighbors! My good friend, Kim, reminded me that trading for services has helped them while her husband is looking for work. When I was preparing for my second home birth, my wonderful midwife allowed me to do some office work for her to reduce the out-of-pocket expense of a home birth. This is an area where you can really be creative. If there is something you want or need, offer a service in return. You can offer a piano teacher with small children childcare in exchange for lessons, if you have a friend who works on cars, trade house cleaning for car repairs. Really, sky's the limit on this one. If you have a talent or skill, offer it in exchange for something you need. Each person will need to decide for themselves whether or not this is an option. But I do know that you can make a lot of money by participating in clinical trials. Just be sure they are second round trials or beyond. Meaning, they have already done at least one round of testing so that you're not a first round guinea pig. Just Google "clinical trials in (name of city)" to find out if there are any studies in your area. Here is a sample of studies and money to be made in our area. Sometimes it's hard to let others know about our struggles. Trust your friends, family, and church family to help in your time of need. Graciously accept help when it's offered. Don't be stubborn or embarrassed. A true community is one that reaches out and helps one another. It's the way it's supposed to be. Sometimes we lose sight of that in our pride and desire to do things in our own strength. This bears repeating. Opening up new credit accounts or maxing out the credit card does not count as additional income. It's just more debt! Sometimes it's easier to just charge for your needs rather than working a little harder to earn the money. I understand that sometimes life just doesn't allow one to go out and earn extra money, but exhaust every other resource before resorting to adding new debt. Has this been helpful? If so, please consider sharing on FB, Twitter, or Google+. What ways have you made additional income? Please share! 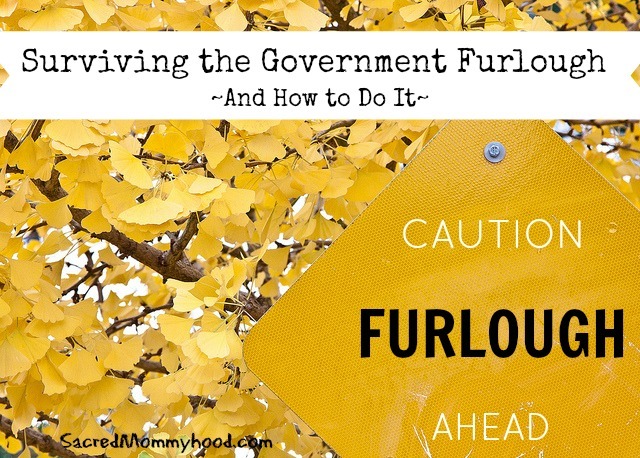 Good stuff to keep in mind even if you aren't Furloughed. I have been a Pampered Chef Consultant - one of your suggestions above and the added money is nice and the bonus pay off comes at tax time. The write offs really help. Thanks Collen. I love Pampered Chef, but have never sold it. Some of my friends do, and I know they have really enjoyed it. Thank you for adding these ideas! Great tips!